In a relief to rail users in the State, the Amaravati bench of the Railway Claims Tribunal (RCT) was inaugurated at the Guntur Railway Station on Friday. GUNTUR: In a relief to rail users in the State, the Amaravati bench of the Railway Claims Tribunal (RCT) was inaugurated at the Guntur Railway Station on Friday. Inaugurating it, Justice V Ramasubramanian of the Hyderabad High Court said the Guntur Bar Association would make best use of this opportunity to emerge as the best bar association. Advocates should constantly follow ethical practices, he added. Chairman of the RCT (Principal Bench) Justice K Kannan, South Central Railway General Manager Vinod Kumar Yadav, Principal Chief Commercial Manager MG Sekharam and Railway Guntur Division Manager VG Bhooma were present on the occasion. Stating that the RCT was established for quick disposition of justice to the victims, Justice Kannan said there were 33,000 cases in the trial stage at 22 tribunals across India. “In 90 per cent of the cases, humans are the victims, and the rest are related to goods and claims.” While thanking GM Vinod Kumar for materialising the RCT bench in Amaravati in record time, he said the Indian Railways paid Rs 600 crore as compensation to eight lakh families of the victims. 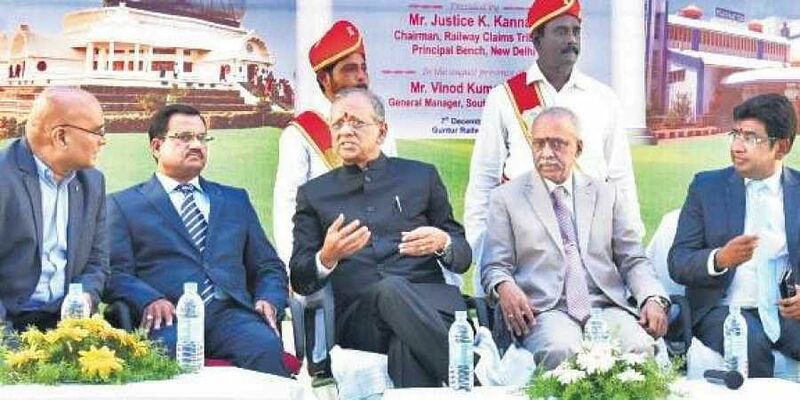 Meanwhile, general manager Vinod Kumar Yadav said the RCT bench would prove to be of much assistance to rail users in Vijayawada, Guntur and Guntakal divisions. “It will speed up settlement procedure of all pending cases and help the public of Amaravati region in early settlement of claim cases of both passenger and freight segments,” he added. The RCT’s Amaravati bench, which is presently housed in the multi-functional complex on the railway station premises, is a temporary accommodation that has been renovated at Rs 75 lakh, Vinod Kumar said.